"Starburst is the proof less can definitely be more, with plenty of chances to win, although the low variance won't sound very appealing to high rollers." 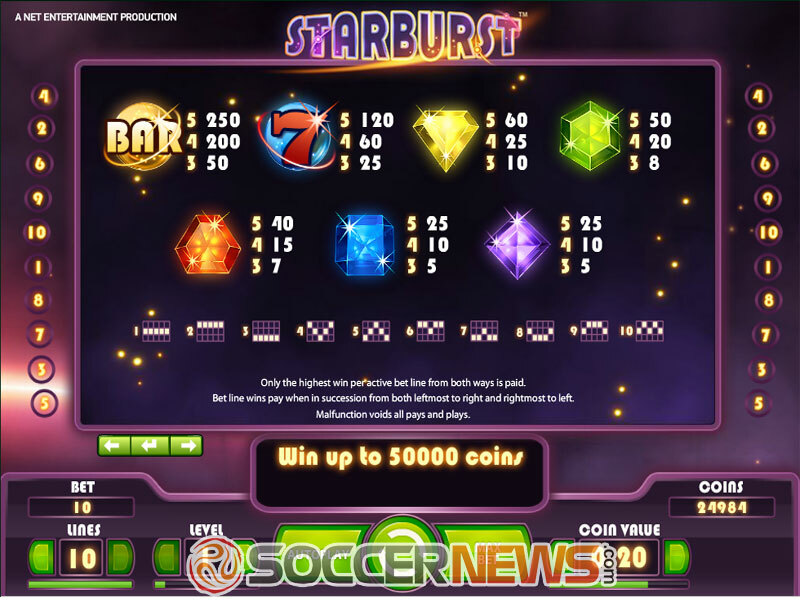 NetEnt went really creative with Starburst, a five-reel video slot with 10 adjustable paylines, which may seem quite simple and not very engaging at first sight. 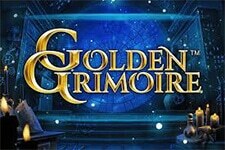 But, not even for minute should you think that, because the game has couple of aces up its sleeve. There's much more to Starburst than it meets the eye. First of all, the colorful scenery is gorgeous at its simplicity, with the main theme resembling popular games like Bejeweled, which is obvious because of the sparkling jewels the game features. 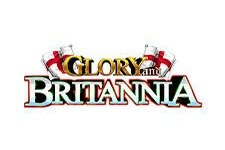 Apart from its appearance, the game offers very interesting features to keep the players entertained. 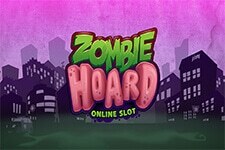 The game pays both ways and brings amazing Wilds to boost your chances for huge payouts. The first step in the mesmerizing Starburst adventure is to place your wager. 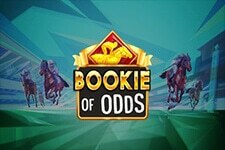 Coin value goes from $0.01 to $1, and depending on the bet level and number of lines played, your wager can be anywhere from $0.01 to $100 per spin. All low-paying symbols are jewels, with maximum of $60 available when landed five of a kind. 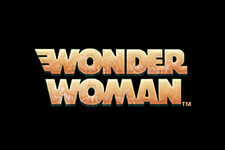 Two symbols with the top value are Seven and Bar, with $120 and $250 paid when all five find their place on reels. Starburst Wild substitutes for all symbols and can only appear on reels 2,3,4 – the middle three reels. When this happens, the Wilds landed will expand over their respective reels, triggering a Re-Spin. 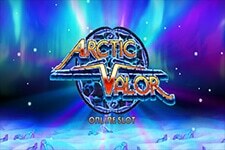 Additional Wilds appearing will award the player with another Re-Spin, with a maximum of 3 Re-Spins available. 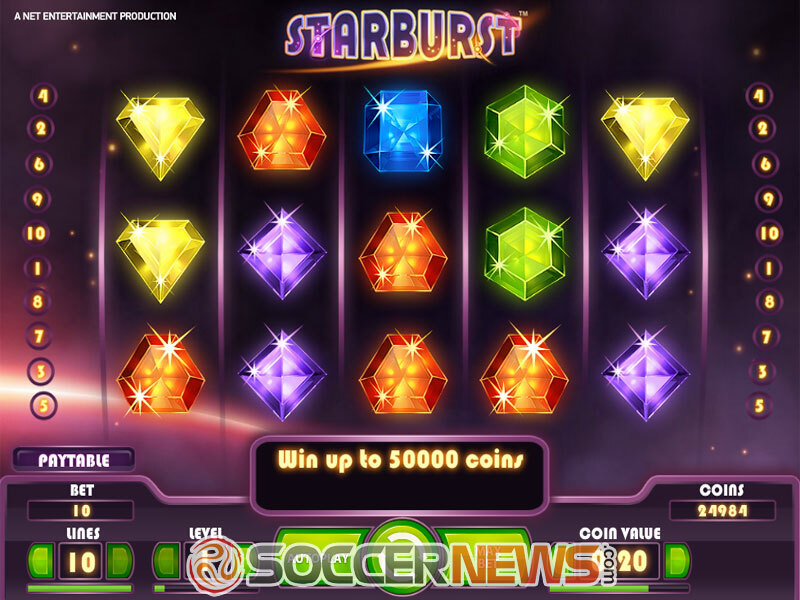 Select Starburst form any of NetEnt's casinos. Land Starburst Wilds on reel 2,3,4 to trigger Re-Spins. 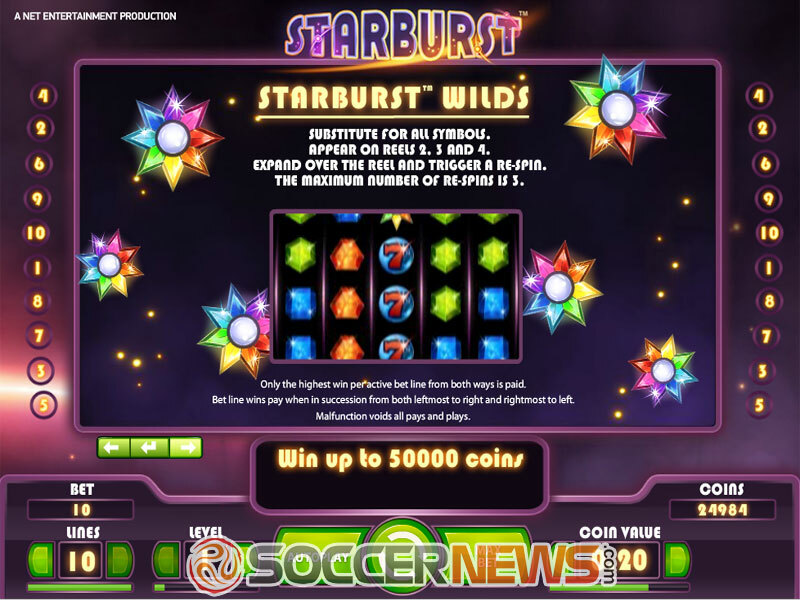 "One of the most popular online slots, Starburst is a combination of mesmerizing theme and energetic gaming experience, available across all platforms. With the game paying both ways and Starburst Wilds in play, everyone willing enough to try out his luck with this release will be rewarded with up to $50,000."